In this June 2,2018 file photo, members of the dragon boat club Aquaholics participate in a training session. 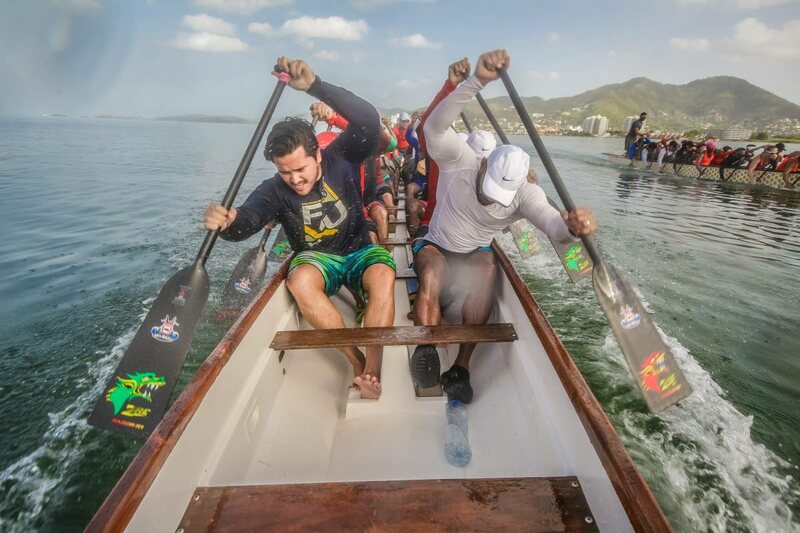 Aquaholics will seek to continue their success in dragon boat racing at this weekend’s Pan Am Club Crew Championships, to be held at Pigeon Point, Tobago. TT’s most experienced and decorated Dragon Boat club, Aquaholics are geared up for the Pan American Club Crew Championship splashing off today, at the Pigeon Point Beach, Tobago. Aquaholics are deemed favourites to capture several titles and will be competing in a total eight events over the three-day competition. They are participating in the: 2,000m Open; 2,000m Mixed; 1,000m Open; 1,000m Mixed; 500m Open; 500m Mixed; 200m Open and the 200m Mixed. The team was established in 2006 since the inception of dragon boat racing in TT and have won gold in Orlando (2012), achieved a world ranking of 12th in Italy (200Metres Mixed) and gold (2000M), silver 500M) and bronze (200M) at the 2015 Pan Am Games, Canada. Reply to "Aquaholics look to continue Dragon Boat success"